Lead singer Molly Snyder Edlerdescribes the music of Riverwest-based trio Cackle as “pagan pop punk.” Thegroup will be playing a show March 20 at the Art Bar, along with another favoriteRiverwest band, Uncle Larry. 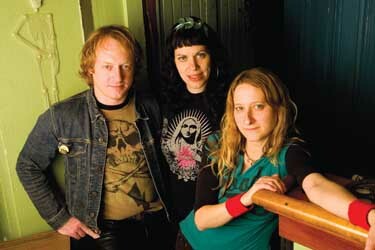 Cackle consists of Molly Snyder Edler(bass, harmonica and lead vocals) Renee Bebeau (drummer) and Grant Gunn(electric guitar). This is the first band for all Cacklemembers, but that doesn’t make them any less dedicated. According to SynderEdler, the band practices “religiously” every Thursday. Their practice venue, aRiverwest basement, sometimes provides challenges in the way of extremetemperatures, as does the difficulty of juggling three busy schedules. But thatdoesn’t hold them back, and practice sessions often last four to five hours. “It’s a creative project we want to seesucceed, and we’re all having fun doing it,” said Snyder Edler. She’s not a novice to the Riverwestmusic scene – Synder Edler managed the band Meddler and wrote all of their songlyrics before she formed Cackle. Now in her early thirties, she said that shewas hit with the question “what do I want to do before I die?” several yearsago. She decided, along with her best friend Renee Bebeau, that they shouldplay music. Synder Edler said her rock-star aspirations were started bywatching Joan Jett on MTV as a kid. Although the March 20 show – along witha May 22 show at Linneman’s – is their first show really playing out, the bandhas played a lot of private parties, especially for Halloween. Synder Edlersays that Cackle’s stage presence is “creepy cute” – perfect for that Halloweenambiance. The band’s debut CD, So Mote It Be, wasrecorded in Riverwest resident Sean Behling’s music studio all in one day. “Itsounds really raw. We’re really happy with it,” said Snyder Edler.